To be honest, we hadn’t a clue. But the Power Mac G5 had dual 2 GHz processors and 1.5 billion bytes of memory. For the opportunity to play with one, we’d fake it. 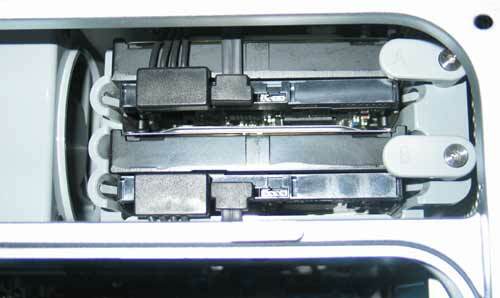 As mentioned in other Journal articles, getting access to the inside of a Power Mac G5 is very easy. You flip open a latch on the rear of the machine, and then remove a large aluminum plate. Underneath the plate is a clear plastic air dam that routes air through various sections of the G5, making sure it stays nice and cool. Remove the air dam and – you’re in. To add or remove memory, you need to pull out the fan (or, in the case of the dual-processor models, fans) located in front of the memory modules. 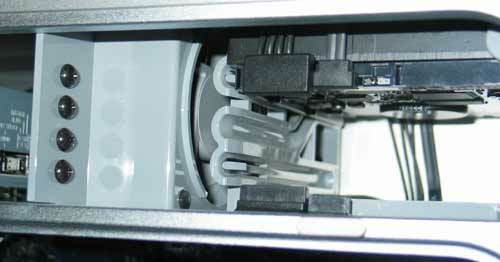 The fans are molded into a plastic assembly that easily pulls out. Then you insert memory, in matched pairs, in the RAM slots, and reseat the fan assembly. Easy. To add a drive – we hadn’t a clue. Just from looking inside, it seemed obvious that one drive was already in place (of course), in a funky plastic assembly that looked entirely unlike any hard drive mounting rails we’d ever seen before. We thought we could fake it without the manual, but the owner, suspicious of our enthusiasm, made us read the manual. Or at least a few pages of the manual. The drive we were going to install was a Seagate Technologies 160 GB Barracuda serial ATA hard drive. It came with a very large sheet of instructions for installation, all but one tiny corner intended for Windows users, and a CD-ROM with drivers, also for Windows. We ignored everything but the drive. After removing the plastic screws from their storage area inside the G5, we screwed them into the sides of the Seagate drive, instantly transforming them from plastic screws to “drive guides.” There are four of them, two per side, since, heavens, you certainly wouldn’t want an unguided drive in a Power Mac G5. Next, we put the air dam back in place, put the cover plate back in place, and turned on the power. There were no bright flashes, no plosive sounds, and no smell of smoke, so the drive (and the Pi Labs crew) passed the first test. After logging in, the G5 greeted us with a message saying it had an unformatted device, and did we want to do something about it? We said no; we had other plans. Our first step was to launch System Profiler (in Applications/Utilities) and look at the ATA bus. As we suspected, the drive we installed was identical to the one that came with the Power Mac G5: a Seagate ST3160023AS. The only differences were in the serial numbers. 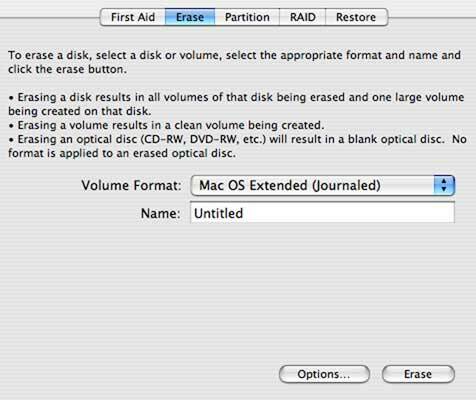 We then launched Disk Utility (in Applications/Utilities) and told it to erase the new drive. It offered a choice of Mac OS Extended or Mac OS Extended (Journaled). Without going into detail why, we selected Journaled, since this offers some nice protection against certain hazards at a very slight cost in speed. Then we clicked the Options button. See the accompanying illustration, Step Four. Step Four: erasing the drive was easy. 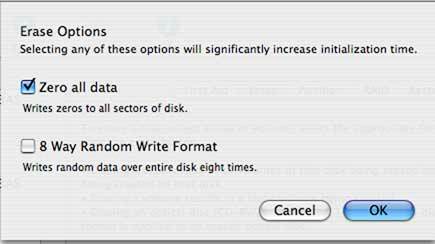 We launched Disk Utility, selected the proper drive, pressed the Erase tab at the top, selected Mac OS X Extended (Journaled), and then pressed the Options button, down at the bottom. You don’t have to press the Option button to erase the drive, but since this particular drive will presumably be holding something important, why not make an effort to be careful? The Option button reveals two choices, “Zero all data” and “8 way Random Write Format.” As you might expect, the first option will write zeros, expressed in binary, to every single byte on the drive. And if for some reason it can’t write one of the 1.3 trillion bits necessary to perform that task, Drive Utility will give you an error message. In other words, this option is a cheap and easy way to test the drive before you start putting your precious data onto it. 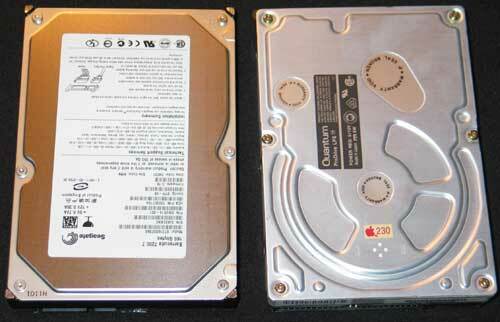 The second option is designed for erasing drives before they are discarded or used for a new purpose. In theory, this is an even better way to test a drive: every byte on the drive is written to eight times, using random data. Unfortunately, since this takes eight times as long, and this drive had a 160 billion byte capacity, we simply didn’t have the patience. We wanted to play with the G5, not have it spend a day writing random junk on the hard drive. See the accompanying illustration, Step Five. Step Five: selecting zero all data will make erasing the drive much slower (especially on very large drives), but it also forces the Mac to actually visit, and write to, every byte on the drive. You’d like to know the entire drive is in decent shape before storing things on it, so spend the extra time and select the first option. If you want a very thorough test, select the second option, which takes eight times as long but definitely does confirm, one way or another, the health of your drive. Even zeroing all data on a drive this size takes quite a while, so we did other things. When we happened to notice it was done, we quit Disk Utility and admired our handiwork: a really huge, empty drive. What could we fill it with in a hurry before the owner showed up to claim his property? QuickTime clips? Copies of Apple’s electronic license agreements? A few day’s worth of the Congressional Record? Surprisingly, there just wasn’t enough stuff floating around within easy reach to make even a dent, and we tried. Adding the drive was easy. It was fun. It was educational. And it was returned to the rightful owner. How sad.